We should start early this day to Cambodia border. I’ve read we should reach it before 12 PM because it is the time the buses from Khao San Road arrive with big groups of people which can add a big delay on the procedures. It should be a 3 or 4 hours’ drive, so we really should be there before that time. In Aranyaprathet we would use a secure parking to leave the car, as it cannot cross the border with us. We would then follow the steps by foot: Thailand exit stamp, Cambodian visa and entry stamp and getting a taxi to Siem Reap. These are simple steps, but there are some added difficulties here as there are touts anywhere trying to fool you to make you think you need their services. As far as I read it is impossible crossing this border without some attempts to scam. From Poipet, once in Cambodia, to Siem Reap is a two hours’ drive on a new road so we think it is feasible to reach our destination by lunch time and spending the afternoon on getting our three days pass to Ang Kor and visiting the isolated area of Roulous. We take our breakfast in Greenleaf’s guesthouse, after checking out from the hotel, with the people we spent yesterday. We pay the dinners, breakfasts and beers, which is less than 20€ in total. We say good bye to everybody, who is following different paths. The French boys are being taken to Pak Chong train station. We get Puma’s advice of not going through the park but taking the way passing by Saraburi instead because, although the first seems a shorter way, it is a quite slower path and we must pay the park fees. There is a farewell with him as we’ve enjoyed so much out time together and expect to come back sometime in the future with the excuse of watching the bats. The drive to Cambodia border takes 4 hours with just a quick stop and we’ve already failed on our first goal: to arrive before 12 PM when it is expected to meet the big groups from Bangkok. But it is 1:15 PM now. As we’re approaching to the border we can see people around offering things or trying to address us to different places by gestures. This is the street ending in Cambodia, but it gets cut before reaching the border and, as I don’t want to stop, I turn left getting into the market. I stop there and try to take a look on the map, but I can see a bunch of men coming to us on bicycle, so I just keep going on for taking the street we just left again. This time I’m paying attention to the big parking in the left side where the street gets cut. Immediately two touts come to me and I just ask “Secure parking?” and they obviously agree and one keeps following me during the process of taking the ticket from the box and looking for a space for leaving the car. I still don’t know if he wants to sell me something or a tip for his “service”. I’m going to the end of the parking (0) trying to leave him behind but when the car is parked we’ve got the man with us again saying things through the windows. When we get out from the car I can see two more men. I get nervous as I need to take the laptop from the trunk and I don’t want they can see we leave our baggage in the car. Last night we separate the things needed for the next three days in hand bags, which is the only we’re going to bring with us to Cambodia. I don’t know what to do with the parking ticket: if I leave it in the car I have the risk of not having a justification document in case of something happens to the car and if I bring it with me to Cambodia it could get lost. In the meantime, the tout keep talking to us. We leave the car and walk to the border and tell clearly to the tout we’ve already got visas because he haven’t stopped of offering them. But he keeps following, offering taxi on Cambodian side this time. I answer him we already booked one (this is a lie but I bring the phone number of www.angkorcars.com just in case). He asks me how much I’m going to pay for it and I answer 40$, then he tells me they can make it by the same price. I decline stating it is already waiting for me and I’m not going to break our commitment by the same price, then he offers me the service by 35$. As I hesitate for one second he calls a boy and asks him to be with us to close the deal for the taxi. He is with us while we walk along the avenue (0 to 1) to the Thailand immigration office. Both sides of this avenue are full of small offices of business dedicated to the same thing: offering Cambodian visa. The word “Visa” is written everywhere and, in case someone doesn’t get it, men are shouting from the office’s doors offering visas. During this walk the boy keeps talking about the excellences of their taxi service. I hope he is not going to be able of being with us once in the procedures for leaving the country. This point is set in a way that the people leaving Thailand takes the path at left, while the path at right is for the people entering the country. The boy points me where to get the exit stamp in our passport but he is not coming in with us (1). Once inside, we join one of the rows with around five persons on each. The big groups must be out already. When we go out to the street again, the boy is there waiting for us. He asks us again if we’ve got Cambodian visa as this is going to be our next step and seems to be the bigger business here. We pass under an arch with towers as the ones in Ang Kor and that’s the line for the change of country. At the other side the street is full of live with business and trucks and there is even a casino! I’ve read this pass is a bridge, but we don’t have the feeling of being on a bridge. Keeping our left side we reach our next stage and it is here where the boy cannot follow us. Then he opens a notebook and says with practiced naturally behavior “It is 40$, are you going to pay me now?”. I’m shocked. We agreed 35$ but it doesn’t matter now as I explain clearly we’re not going to pay anything in advance. He tells us his friend is waiting at the other side and I repeat I have a taxi waiting for us too at the other side which we’re going to pay at arrival. He acts surprised and takes his cell phone, then I say “good bye” and go on knowing he cannot follow us further. We’ve got the feeling of being successful from the first attempt of scam and reach what is signed as Cambodian sanitary control. We’re attended by two persons there, one wearing military uniform and another wearing black trousers and soft blue shirt. There is a row of tables and there are a couple of persons on each of them wearing as mentioned on each. We must fill a formulary about vaccinates and diseases and they don’t check any of our answers but, when leaving, the man wearing blue shirt comes with us. He seems to work there ready to help us on anything we could need but, why are we the only tourist with local company? I’ve previously read a lot of stories from people crossing this border and in some of them some worker help them on everything and even gets a taxi for a better price than expected in exchange of a small tip so, if this is the case he is more than welcome. But I was still on alert mode. He gets in talks with us and when asking if this is the first time in Cambodia I answer another lie: this is the first time for my wife, but I came some years ago. I’m trying to avoid any scam attempt because of newbie. He points us where we must get the entry stamp (3) and wait for us outside. We take a formulary, as everybody else is doing, and fill it with our data – the same that is in our eVisas – while waiting in a row as short as the previous one. Then we get the stamp and the eVisas are taken from our passports. Once out, our new friend wants to put us in a minibus which is going to take us to the transport center with the rest of the tourists inside. As I’m still in alert I tell him we have a taxi waiting for us, but he answers there is a bus there to Siem Reap by 10$ and he is going to assure we don’t have any problem. So we get in and he too! “He was working in the border, wasn’t he?” I wonder. I’m not comfortable with the fact that we’re the only tourists in the bus with an assistant. After a short ride of 5 or 10 minutes he points me the ticket windows for the bus. Are we really going to be able of going to Siem Reap by only 20$? I haven’t read anything similar to this so I still want to be sure and comment him the last time I visited Cambodia the bus was waiting for leaving for hours as it doesn’t unless it gets full, but he answers me it is already full. He comes to us to the bus once we’ve got the tickets and I’m expecting the moment he suggests us a tip, but it is not happening. We’re seated in the bus, which is really almost full, he gets in with his other colleagues wearing the same uniform and count the empty chairs, around 7-8, and decide it is full and seat each of them on an empty seat, one of them at my right. So it seems these people working in the border are coming to Siem Reap with us. I’m trying to explain this to myself: as it is 2 PM, this could be the end of shift time and these officers working in the border assure the bus gets full to use it themselves to go home. If that’s how it is we’ve been very lucky, but that’s not how it is. The truth is the three hours we’re told this trip takes are a long and constant commercial event. Each of these “border workers” are seat spread all around the bus and talk with the people trying to get information of what all of us are going to do there, focusing on hotels and tours to Ang Kor and then they confess that, apart from working at border they’re tuk tuk drivers and keep trying to make people get the hotels they’re offering or changing the ones already booked and, obviously, getting all the pressure to be hired as driver or guide to the temples visit. I explain another lie: we’ve already contacted a guide with a tuk tuk which speaks Spanish, something we need because my wife doesn’t speak English at all and my hotel is not only booked but already paid – this last one is truth -. He asks me to quit our driver and he does the same by the same price: 50$ (as I said was our deal). But I explain to him we already know tuk tuks are cheaper but we’re paying more because: first, he speaks Spanish, and second, he is going to take us to Banteay Srei, a further temple. But he doesn’t give up and keep getting pressure over me during the 6 hours of this trip. Twice what taxis take and the time we were told! The bus makes one single stop in a bar full of children asking for money. They use that stop to contact with the rest of the passengers couldn’t be contacted in the bus. We arrive some minutes after 6:30 PM and is already dark. The visit to Roulous is gone. In the last hour of travel our friend has tried harder to get a deal from us but I don’t want to close any deal yet and keep stating we’ve already got a driver and we need he to speak Spanish. He doesn’t give up and, when the bus stops in a dark place in an unknown point of Siem Reap, he offers me to taking us to our hotel for free. He then takes his tuk tuk parked just beside the bus and leaves us in the door of Hotel Prum Bayon in a short ride. There he does his last move: 40$ and he asks me when and where are we going to meet our driver tomorrow. I answer 8 AM in the morning at this same hotel hall where we are now. He says is going to be there tomorrow and I say he can do whatever he wants but I have something to offer: I ask for his phone number to call him in case tomorrow morning we have any problem with our driver. I get his number and I pay him a couple of dollars for the ride in case we no longer see each other. When he leaves I’ve got the feeling I manage to have what I wished. It is not I don’t want him as he has worked hard for it and he really has helped us at border and later on asking in exchange just to give us a service we really need anyway with the rate I was thinking to pay, but I wanted to have this afternoon – evening now – to compare. And we still can hire him tomorrow. Hotel Prum Bayon (0) is beautiful and we will use soon the swimming pool we can see from our balcony, from which is taken the picture below at left. We love our colonial style room. 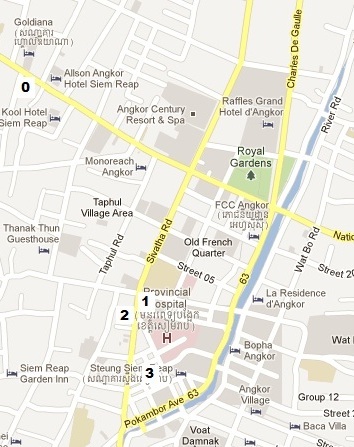 We go out for a dinner following the map and indications we’ve got at hotel’s desk. We walk to the area with bars with a clear name: Pub Stret (3) and it is the one in the picture at right. Obviously these pictures are not from today as we are not going to have daylight until tomorrow. It is hot at night here and we notice it while walking through the street full of hotels. It is a big contrast with the big buildings and gardens from the luxury hotels on broken pavement, whether in the sidewalk or road, and between businesses in shacks. The street is full of people and when we pass through a group of locals with beers in their hand one of them stands from the floor and says “We meet! This is destiny!”. It is our friend from the border we just leave 30 minutes ago from being almost the whole day together. “This means tomorrow we will go with me”. “Will see” I answer and as we’re going he shouts “Tomorrow I’ll be at hotel at 8 AM”. When we reach what in the map at right is labeled as Sivatha Road (yellow street from yellow street) we can see the change. There is even more life on this street, full of tuk tuks going on both directions, neon lights and people walking around. We ‘re offered services from every business door: massage, food, tuk tuk… Those tuk tuks are stopped at sidewalk with its driver laid or seated on it and we’re offered their service for tonight or for our Ang Kor visit from every one of them. At least I can compare rates. The lower I can get is the same 40$ I already have with something I “know”. It is obvious that Cambodia is a poorer country than Thailand. Siem Reap is a city completely built to allocating the tourists coming to see Ang Kor: it is composed basically by hotels and has a city center with bars, restaurants and markets. We walk back to the hotel and look how funny the pedestrian traffic lights are here: There is the typical little green man animated as walking and a countdown over it, as the time is reaching the end the little man runs faster and faster until ending in a desperate sprint for the last 10 seconds. Yep, we’ve got the message.